Campaign to Stop Killer Robots. Internationally, there is growing alarm among a majority of states of the need for legally binding controls on emerging technologies that are leading towards the development of lethal autonomous weapons. While such weapons do not yet exist, experts claim that we are only a matter of years away from such a reality. Lethal autonomous weapons, also known as ‘killer robots’, would be machines that could identify targets and carry out lethal force, without any human control. Internationally, at multilateral disarmament fora, this topic is being hotly debated, with the majority of states seeking to implement a legal ban as soon as possible, as well as calling for all states to implement domestic legislation, before such weapons are in existence. However, there is so far failure to agree on how to reach this objective. A small number of states, namely Australia, the USA, China, Russia, South Korea, Israel and the United Kingdom are blocking such efforts, claiming to wish to explore the ‘humanitarian benefits’ of such weapons. As such, the recent sixth meeting on lethal autonomous weapons systems at the Convention on Conventional Weapons (CCW) concluded without a treaty, and instead the states involved have recommended in the final report, that the CCW deliberations continue on this topic next year. Meanwhile at the business and grass roots level, there is also growing concern from tech experts, electronics companies and AI organisations that wish to see a ban implemented so that their technological advances and skills are not mis-used. For example, there was a recent pledge by tech leaders and workers, to “neither participate in nor support the development, manufacture, trade, or use of lethal autonomous weapons.” This pledge has now been signed by 241 organizations and 3117 individuals. 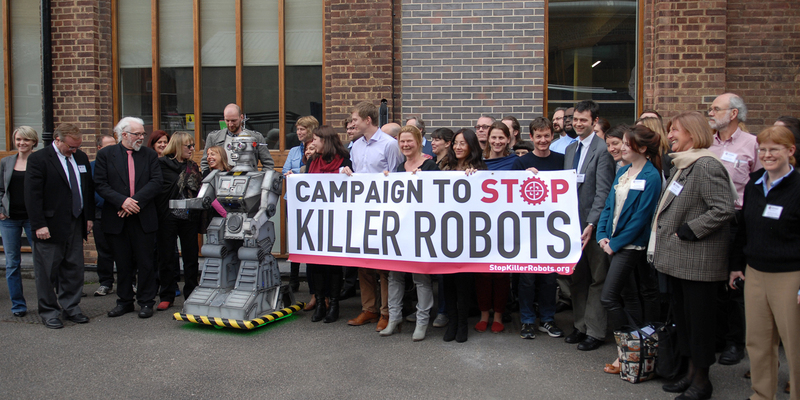 Read more about the Campaign to Stop Killer Robots here. The New Zealand Campaign to Stop Killer Robots, is coordinated by Peace Movement Aotearoa, and the page can be accessed here. Read about the Future of Life Artificial Intelligence pledge here. Access the Human Rights Watch publication on Lethal Autonomous Weapons here.